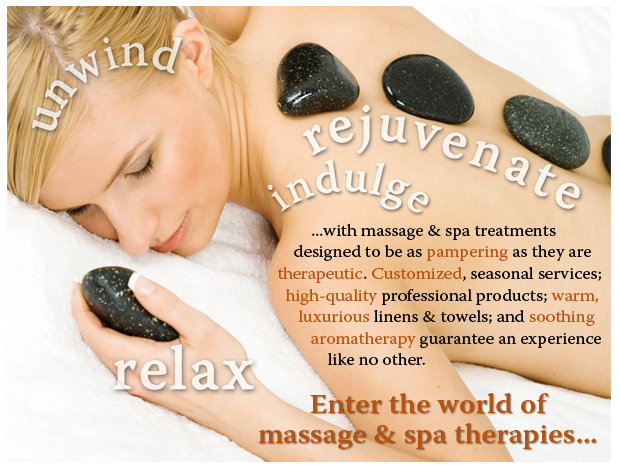 New to massage & spa therapies? CLICK HERE for information about what to expect during your session. Wanting to learn more about Carrie's massage therapy rates & services? CLICK HERE to "read all about it." Interested in Carrie's therapeutic spa services? Wanting to schedule your appoinment? CLICK HERE to fill out a short Appointment Request form, and start experiencing all the benefits of massage & spa therapies today! CLICK HERE for gift certificates, fabulous gift sets, and other indulgences that all the special women in your life are sure to love...plus, it's always the right size and color! CLICK HERE for directions to Carrie's office. Trying to find the answer to a massage or spa therapy-related question and can't seem to find it here? CLICK HERE to email Carrie your questions, comments, or any other thoughts. She would love to hear from you! Be the first to know about Carrie's newest specials, promotions, and services! your next massage or spa therapy service of 30 minutes or more! Limit one coupon per person, please. Carrie dislikes unwanted emails as much as you do, so please be assured that your information will NEVER be rented, sold, or otherwise distributed to anyone else. And, if you ever wish to unsubscribe from Carrie's list, simply send her an email to let her know, and your name will be removed promptly. Thank you for your interest in massage & spa therapies! Except for logos of Arbonne, Studio 2, AMTA, State Medical Board of Ohio, Union County Chamber of Commerce, BIOTONE Spa and United Way, all of which are the property of their respective owners, the contents and graphics on this website are Copyright © 2012-2017 Carrie Bezusko.